Barbara Muir Paints: That's what we're waiting for! blue bells, just sooooo beautiful. There might even be some ducks. There were Canada geese there the other day. the first brave flowers of spring. Have a dreaming of perfect weather day. Love this Barbara! 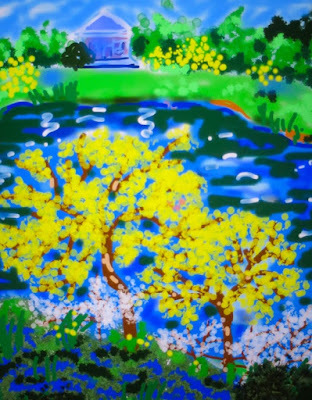 Yesterday, the 10th, was a perfect spring day here--all my forsythia are in bloom, and between them, the daffodils and my pear and cherry trees the yard is a beautiful palette of yellow and white--like your painting! Music to my ears. I sat in the dentist's office today looking out at a highway and parking lot, grey, grey, grey. Grey cars, grey streets, freezing rain, grey skies. I am all ready for this!